Alliance of Cardiovascular Professionals members can access results from our comprehensive 2017 wage survey which can provide valuable career guidance, especially if you are seeking a new position or negotiating your salary. Thanks to our network, the data reported in this survey provided unique insights into cardiac professionals’ wages across regions, specialties and disciplines. 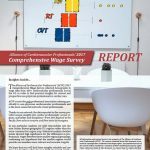 MEMBERS-ONLY: Results are in from the Alliance of Cardiovascular Professionals’ 2017 Comprehensive Wage Survey report, available now for ACVP members. ACVP’s survey collected demographic and wage data from 450+ cardiovascular professionals across the U.S. in order to find practical insights for current and prospective non-physician professionals in cardiac care. Access the above resources immediately by creating an account and joining the Alliance of Cardiovascular Professionals, online. As a member, you’ll also get access to our supportive network of members and professionals who can help you further your career or find new opportunities. We look forward to supporting you as a member!